Millions of Christians around the world commemorates today Jesus Christ's crucifixion on the holy day known as “Good Friday” that falls just before Easter Sunday. “Good Friday” is known in Egypt as “Sad," "Great" or "Holy Friday” in which the main Church in Egypt, the Coptic Church, holds prayers from early morning until around 5pm. According to biblical beliefs, Jesus was arrested and sentenced to death after he was accused of blasphemy. Jesus carried his cross to the site of his execution, called "Golgotha" in Hebrew, or the place of the skull, and in Latin "Calvary." There he was crucified along with two convicted criminals. Jesus was agonised on the cross for six hours. According to the New Testament, during his last three hours on the cross, from noon to 3pm, darkness fell across the land before with a loud cry Jesus gave up his spirit. The cross for all Christians symbolises essential belief in the Christian faith. “During the day, we read all of the four gospels step by step throughout the day. Then at the end of the day we have a symbolic burial of the icon of Christ in rose pedals, using the embalming spices they used,” explained Angaelos. 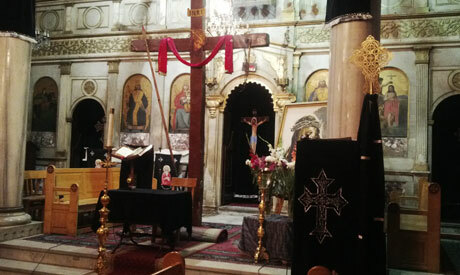 He added that the icon of Christ is buried in the altar and left until it is raised againt Saturday night, symbolically signalling the resurrection. Speaking of how different churches mark Good Friday, Angaelos said that all churches around the world commemorate the event, despite slight differences between them. “The whole Christian family of churches — Catholic, Orthodox or Protestant or anyone else — commemorate this particular event because it is the core of our belief. It all revolves on the scripture, on the crucifixion and resurrection,” said Angaelos. He underlined that all churches around the world come together on the understanding of the crucifixion and resurrection of Christ, with each essential to the Christian faith. The three days before Easter Sunday, for Christians, are the holiest three days of the year. After Holy Thursday, no mass will be held until Easter, which proclaims Jesus's resurrection. I think Christians are living a 2000-year-old misunderstanding about Jesus. Jesus never claimed to be God. Jesus never equated himself with God. He said "my father was greater then me" and "I do nothing of myself." Indeed Jesus prayed to God. Hence, Jesus was not God. Does God pray to himself? Jesus was a prophet, not God, God doesn't die.